Years ago, the fact I knitted horrified some of my feminist friends. They saw crafts, especially things like cooking, baking and needlecrafts, as conformation to some male imposed stereotype: knitting was a form of being suckered by the male hierarchy. This view was common to the point, I felt unable to knit when at some folks’ houses (and for me, knitting is just my default setting – something I do without even thinking, wherever I go). Yet I felt, even then, that by seeing crafts as subservience, my friends were missing the point entirely. I felt I was celebrating something feminine and that for me, was my feminism. I read somewhere that whilst men have been busy fighting wars, women were quietly knitting; being creative. Later, when I knew more about the history of knitting, I saw it was not a ‘feminine’ occupation at all until the 20thC; neither male nor female but more a case of celebrating human ingenuity. Historically, perceptions have shifted backwards and forwards, so in some periods knitting was seen as a male pursuit; in some, a female. Often, in 20thC culture, male = “professional” and female = “amateur”. Hopefully we have moved on from this. I think we are finally finding balance again, where knitting belongs to everybody. But women of my generation endured that lengthy period of time when even other women despised what we did, as – ironically – it was denigrated because seen as ‘feminine’. In the 19thC, knitting “‘was a universal occupation, both for men and for women…'” (Rev W Nicholls, in The History and Traditions of Mallerstang Forest, 1883, quoted in ‘The Old Hand Knitters of the Dales’ (p. 70., Hartley & Ingilby, 1951). In the early Industrial Age, both women and men knitted. The earliest recorded professional knitter, was female. Kirsty Buckland cites the City of the Ripon Chapter Acts for the first hard evidence of an English knitter – one Marjory Clayton of Ripon, referred to as ‘cappeknitter’ in 1465. Later, men only knitted in remoter areas, which were generally isolated from society as a whole, like the Dales and parts of Scotland and Wales. Still later, it is recorded, men became embarrassed and derided for knitting – so gave it up, or at least, gave it up in public. By the 1970s, it was seen as so thoroughly ‘feminine’ that even women were giving it up; in a society that judged you for conforming to the perceived male oligarchy. Especially in educated circles. Sometimes I felt like I had to defend or justify it – and sometimes it was my dirty secret; something I better not do in front of people. And yet, the more I learned of the craft’s history, the more I realised that knitting is a defiant, feminist statement – not a sign of being cowed by male oppression. Moving beyond feminism, it is full of the triumph of the human spirit; creativity, artistry and democracy. Interestingly, ‘expert’ knitters, ever since the dawn of the TV age, have tended to be men. 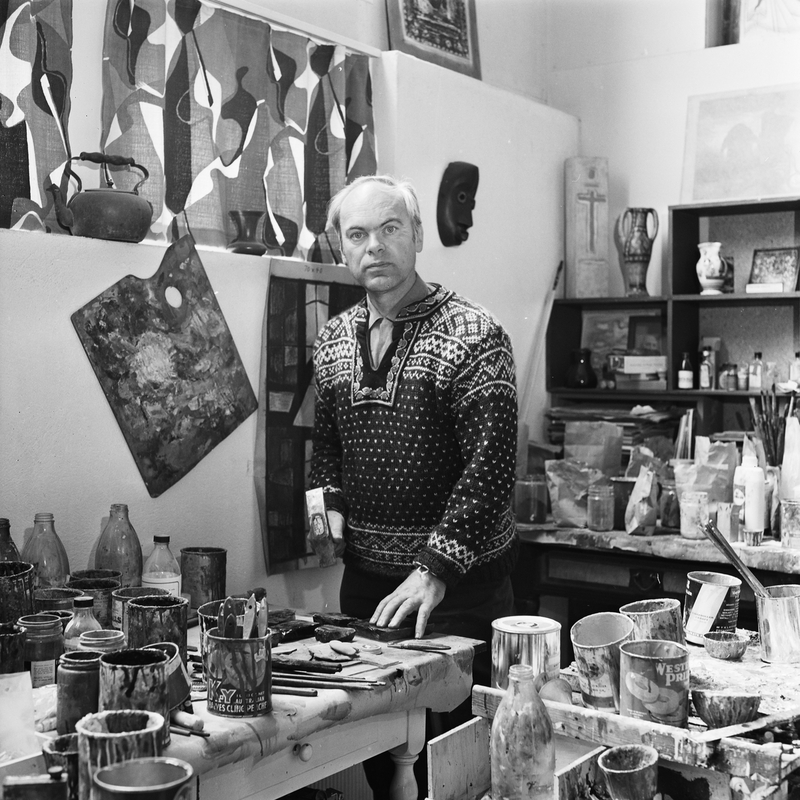 Designer like James Norbury (1904-1972), or Kaffe Fassett and knitting historian Richard Rutt, came to define the craft for their respective generations from the 1950s – 1980s. Rutt was taught to knit by his blacksmith grandfather. Many of the (female) Dales knitters interviewed between the 1950s-70s, said they too were taught to knit by grandfathers. Knitting seems to have almost – but not quite – died out amongst men. More accurately: men knitting in public nearly died out. Yet, whenever knitting hit the big time, we seem to have seen it through male eyes; and maybe sometimes culture has denigrated it as the epitome of frivolous or unimportant even when these male knitter ‘experts’ absolutely did not. (The Penguin Knitting Book, James Norbury, 1957). Since writing the above, Tom worked on a reverse engineering project of his own, with this glove, so probably became more acutely aware of the intricacies of this pair of gloves, than he could have guessed at the time of writing that post! I still maintain this is the most complex extant Dales glove. Marie Hartley and Joan Ingilby, in ‘The Okld Hand-Knitters of the Dales’, thought it a more primitive example than the later gloves – but then, they weren’t knitters! Rutt’s version was perfectly sound and creditable – he had also picked up the mistakes, inconsistencies and subtleties we found, over thirty years later. It is easy to try to retro-fit our contemporary mores on male ‘expert’s like Norbury or Rutt. Yet they were products of their own time – the bombastic Norbury can come over as the ultimate ‘mansplainer’ – yet the reality was closer to “passionate advocate of our craft”, I think. In the rush to point out inaccuracies in his attempts to deliver the history of the craft, we lose the essence of the man. At least he was trying to piece together the craft’s history and doing it before anyone else. His designs still work. I’ve collected Norbury’s books since the 1980s; maybe only knitted one or two of his designs over that time, but could see they were well crafted, clever designs. There is an element of sexism creeping into knitting, in some places online, with male knitters/bloggers sometimes characterised by women as “mansplainers” and at least one (brilliant)cutting-edge designer who happens to be male, being lambasted for being a ‘fashion victim’, and capitalising on his own ‘notoriety’. When I look at his work, that’s not what I see and I think if men were saying that of women designers’ work, we’d find it unacceptable, to suggest someone only has success because of their gender. The designer in question is successful because he is good at what he does. End of story. All he is guilty of, is betraying a fairly mainstream European sensibility with some photo-styling that (for some people) pushes the boundaries. This is, in reverse, the same kind of sexism that made my own knitting go underground for a decade or more, in the 1980s/90s. When it comes to this designer’s work, I think it is motivated by envy – as when I read the threads lambasting him, the commentators do seem very envious of his talent and amusingly shocked by his photo-styling – or busily pretending not to be shocked. Whilst being shocked. It’s an exercise in pearl-clutching from people who are usually the first to satirise pearl-clutching. We can’t retro-fit our own political correctness to male designers from sixty years ago. In the end, all designers should stand or fall by the quality and usefulness of their designs. We’re now, thankfully moving out from an age where sexism against women or men, is acceptable. Hopefully. Good design is good design. ‘Experts’ may well be male or female. And the same goes for knitters. And the same goes for designers. Norbury’s commentary, introductions and the bits between his designs, may now seem ‘dated’ and even offend our sensibilities; but the work stands the test of time. There is nothing I would not knit, in any of his books that I own. Just as I found, if Rutt’s scholarship sometimes is a bit doubtful – the unseen workings-out behind the scenes of ‘A History of Hand-Knitting’ were impressive. We are all products of our own time but sometimes design, or ability, outlives that time. And design? It has no gender. Yet again, I find myself reverse engineering a pair of Dales gloves and once more, knitting the ‘filler’ pattern known as ‘Midge and Fly’. So thought I’d write a bit about it. ‘Midge and Fly’ pattern was a common motif in two-colour knitting, and can be found on the palms, thumbs and fingers of Dales gloves, and other items. Or, as in the 1840s’ gloves pictured left, the Midge and Fly formed a background for another, more striking, motif. Excuse this image, by the way – it was from a set of our amateurish pictures meant for reference purposes only, so not high quality. But good enough for you to see what I mean! Midge and Fly is a slightly more sophisticated twist on the simple alternating of a dark and a light colour, called ‘salt and pepper’. (See ‘Fox and Geese & Fences: A Collection of Traditional Maine Mittens’, Robin Hansen, 1983, for info on salt and pepper and some other ‘background’ patterns). 19thC Dales knitted gloves often seem to have consisted of two patterns – one elaborate one for the more visible back of the hands, then a different pattern on the palms. The Midge and Fly pattern had the advantage of carrying but the dark and light yarns back round to the front of the glove, and doubling of the yarn trapped air, so had the practical side effect of making gloves warmer. Dales knitters were nothing if not supreme craftspeople. So when you find midge and fly on say the upper welt of a glove, it will segue seamlessly up into the palm, and the pattern will be picked up and repeated, on precisely the right round, when the knitter got to the thumb, fingers or anywhere else. So there are no broken repeats, no messed up motifs (as a rule). This is harder than it appears as, simultaneously, they may have been changing to a new and different set of motifs for the back of the hand. Earlier extant gloves are made from dark and light naturally coloured handspun. Sometimes, post 1860 and aniline dyeing, the dark natural grey or black will be replaced by a vividly dyed colour. One extant pair of children’s gloves appear to have been pink and cream, which is consistent with colour recommendations in Victorian knitting manuals – where pink was perceived as a colour for both male and female babes/young children. Later gloves appear to be spun from millspun again in two strongly contrasting colours. Midge and Fly pattern works well with a strong colour contrast – like most 2 colour knitting. Midge and Fly appears fiddly – especially when you’re happily knitting the main 2 colour pattern on your glove, hit the palm, and have to swap over to it – but its beauty is that it is soon memorised, and after a pair or two, no chart or notes would be needed. Many rounds of it consist just of alternating dark and light, in fact – the ‘midges’ only interrupt the flies every fourth band of simple alternation. Earlier midge and fly patterns seem more sophisticated than later ones, although we should be cautious – that is a generalisation extrapolated out from only just over a dozen extant gloves. And these gloves were knitted in their hundreds of thousands. Here on the left, is a midge and fly from the 1840s. The “flies” are arranged in little groups of four. Later gloves, it seems more common for the “flies” to be singular and more spread out. It is a simple, but visually pleasing design; a handy way of carrying two yarns across the palm of a hand, and a small motif so easy to replicate on fingers and thumbs. And more interesting than salt and pepper. Also reminiscent of the famous Norwegian (Setesdal) pattern luskofte (“lice jersey”, where the dots = ‘lice’!) Speckled or spotted jerseys were knitted in 19thC England – it is possible the midge and fly motif evolved from these. The midge and fly seems to have been a generic background or canvas, against which other motifs were set, much like the ‘lus’ (lice) on the luskofte. And another example of a venerable motif being given a name inspired by something in the knitters’ environment.